Cycling Brittany backroads includes many pastoral views like this. Note: In May, we took a week-long bicycling trip around the northern part of Brittany, France. We’d never done anything like this before; our only biking experience had been rides across town and on urban trails. Over five days of cycling in Brittany, we covered 200 kilometers (125 miles) and climbed a cumulative 2,000 meters (6,562 feet). We were hosted on this self-guided tour, “Backroads of Brittany,” by Exodus Travels, who rate this itinerary’s difficulty 2 out of 5. We say it was just right, and if we can do it, so can you. We were both unsure of how this bike trip would go, but neither of us wanted to admit it. Tom would occasionally wonder out loud if my knees were sufficiently recovered from meniscus surgery to handle a week on a bike. His worry increased as I continued to limp around Europe in the weeks leading up to the ride. I wondered how Tom would manage the hills, and my worry increased when I looked at the detailed itinerary, did some research, and realized this route might not be as flat as we thought. (Then I got psyched out learning the Tour du France had done a stage near here in 2015. I kept that to myself.) Like the old married couple we are, we kept moving forward without expressing specific reservations. No need to worry. Our bodies held up and the whole ride was a joy, particularly fun because Exodus Travels did all the planning and provided the maps and detailed directions. The self-guided tour was a great way to go; we could move along at our own pace (slow) and stop whenever we wanted (“We Brake for Historic Churches”). Here’s how the self-guided thing works: Exodus booked our hotels and also transferred our luggage from place to place. Their representative, the affable Steve Barrington with local operator Headwater, met us at the train station in Lamballe (about three hours train from Paris with a change in Rennes), provided us with bikes, panniers, maps, notes, and downloads. So all you have to do is pedal…and read a map and refer to detailed notes (maybe better suited to walkers that cyclists). We happened to be among the first to use the tour company’s Ride With GPS app, which was a great asset. It’s hard to imagine trying to cycle and stop to confirm every turn along the way. 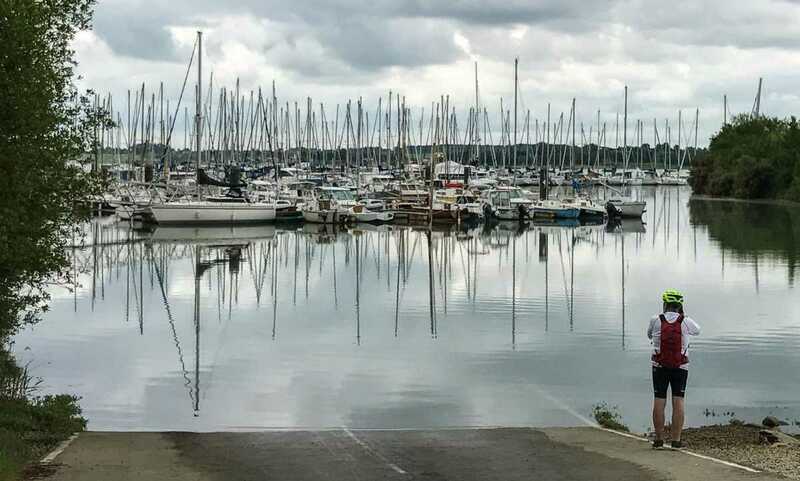 The best parts of the route were lovely stretches through small farms, a grand entrance to the coastline at Préneuf Val-Andre, and numerous river stretches that combined challenging valley hills with serene waterside pathways. This itinerary starts at the gorgeous Le Manoir des Portes in La Poterie outside Lamballe, where we ate an extraordinary al fresco meal from the kitchen of Hervé. (He and his sons operate the manor hotel and restaurant.) While we took in the gardens, Steve gave us the lowdown for the first couple days. After one night at the Manoir, the week would consist of three two-night stays in the towns of Sables d’Or, Dinard, and Dinan, before returning to Lamballe. Having two nights in one place makes it easier on everyone. Luggage is transferred only every other day. On ‘rest’ days, riders are free to tour by bike to recommended sights, or explore the towns and environs on their own. The Brittany Backroads itinerary used well-chosen local back roads, mostly paved routes that could barely handle two cars abreast. Some portions were on designated bike paths, both dirt and paved. Only a few short sections were on busy roads, just to jump over to other trails. We found drivers to be quite aware and courteous, only overtaking us if they could move into the oncoming lane. France has a long history of respecting cyclists. The small seasonal resort town of Sables D’Or les Pins, with one of the many sandy beach coves along the north coast of Brittany. Did I mention we took it easy? 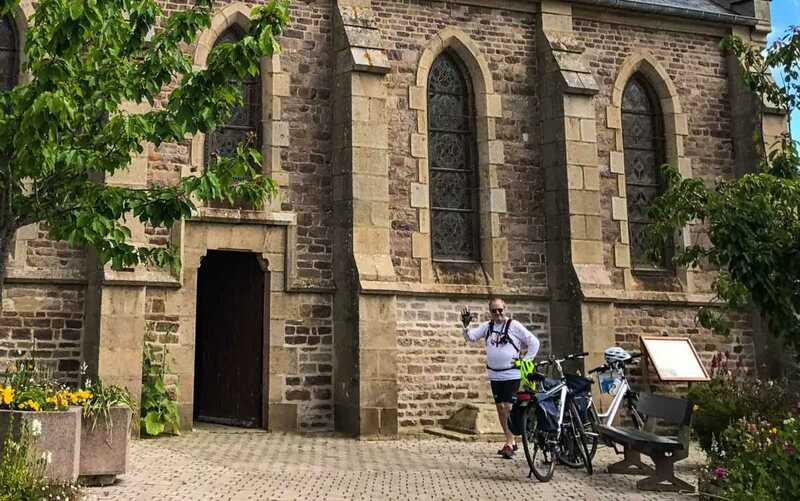 We stopped for photos, for coffee, to peek inside churches, to check directions, to pee, and every now and then to walk our bikes up the last incline of a long, steep haul. Day two was an easy side trip–and we packed our panniers a little lighter. The scenic fortress and lighthouse out on Cape Frehel are well worth the 26 kilometers, and we were just pleased to still be going on day two. The Cape Frehel ride happened to be on a holiday weekend, and traffic was gnarly. It’s akin to Memorial Day weekend in the States, marking the beginning of summer, so we got a kick out of observing all the activities: farmyard weddings, picnics, vintage cars, family dinners, and many people taking advantage of the coastal trails. Steve met us again to review the next couple days. Surprisingly, we were ready for day three’s ride to Dinard, covering more climb and more distance than before. We took some time in the friendly town of Matignon to buy sandwiches and pastries at La Madeleine Boulangerie. Later, we ate our sandwiches at the historic ruins of Chateau Gilles De Bretagne overlooking the L’Arguenon River. 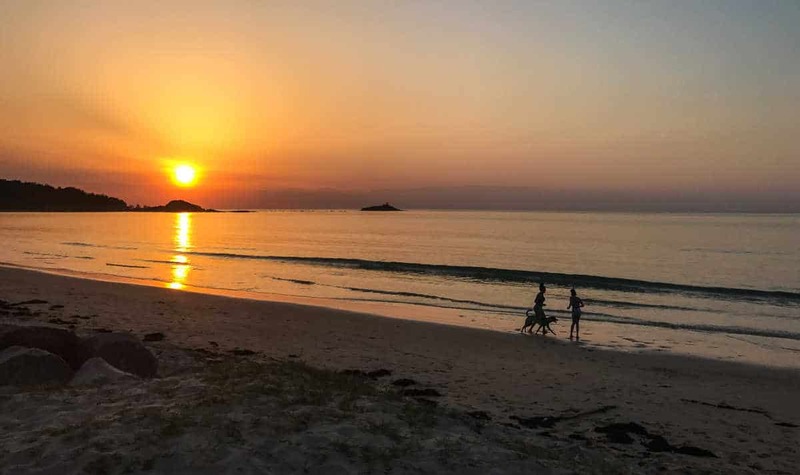 This scenic spot above the tidal river waters was complemented by the views riding into Dinard: tony estates and exceptional horses grazing the green pastures. We took the cool and cloudy day off in Dinard to watch the tides (among the highest in the world) from our hotel balcony. We enjoyed a couple nice meals, and ferried over to the historic town of St. Malo–a good excursion on a rainy day. Before the last stretch along the Rance, we stopped in a park to watch a game of Petanque. Did I mention we kept a leisurely pace? 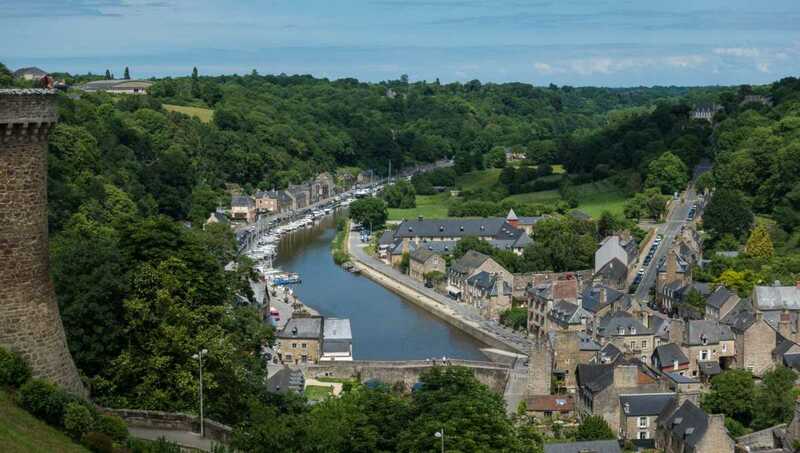 Dinan, a medieval hilltop town, gave us another chance to goof off. Given a little more ambition, we’d have biked out to some other sites, but we enjoyed our day and night of wandering the town and settling in our accommodations along the river. Crazy as it may have seemed when we first set out, on our last day we actually added on a detour–to visit a ruined castle on our way back to Lamballe–making our final stage a 55 kilometer ride with almost 600 feet of climbing. Our butts might have gotten a little sore that day, but we couldn’t help being a little impressed with how we’d adapted to cycling through the week. Even when you start slow, you’ll quickly gain the ability and confidence to go a little further the next day. Thanks Steve, and thanks Exodus! Would you like to know more about where we stayed and what we ate? Check out this post about the culinary highlights of our Brittany bicycle tour. I love the idea of a bike tour with someone taking the heavy gear and all the guidance. I’m not a biker but this sounds possible! Of course you would have no problems! And the scenery from the saddle of a bike is wonderful! Do it. You give me hope! My partner quite likes to cycle – and was using it about 3 times a week to ride to the station at one point. I tried getting on the bike and promptly fell off when I forgot how to go around a corner! Haven’t been on again (and the bike was stolen so I can’t practice). What I haven’t told him is that hte logical way to walk the city walls of Xian is to hire a bike – its flat – but its stone – its gonna hurt if I come off! Maybe a tandem? IF I can do that maybe I could tackle cycle touring – it does sound fun! Haha, the thought of biking the city walls of Xian is wild. As for me, I’d be scared of tandem, but that’s because I’m compelled to at least have the illusion of self-control. If you want to get back on a bike, I highly recommend going to a good shop that can help fit you to a bike and let you test it out. So many of us grew up with ill-fitted bikes and bad habits. Brittany is so pretty, I can imagine biking would be a great way to see it. And your photos are wonderful! I’ve never done a specifically biking trip; just rented a bike for a day. The problem we’d have is that my husband is so much fitter than I am that I’d struggle to keep up and/or he’d get impatient with my snail’s pace. Some friends of ours solved the problem on a bike tour in Morocco: he rode a regular bike, while she rode an e-bike. That sounds like a good solution. I’ve heard the same concern from other couples, but I think the e-bike is a good solution. (I know Exodus offers them for this and other bike tours.) 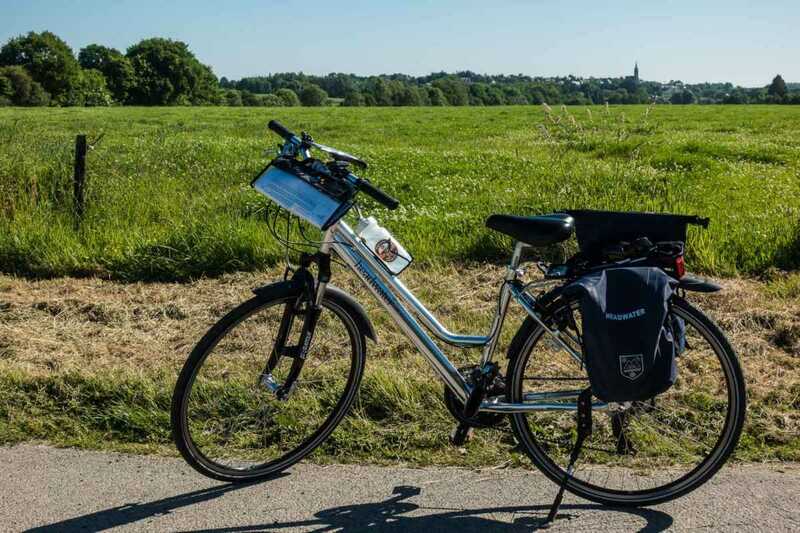 One woman commented that she wanted to bike with her adult kids on a more challenging itinerary, so she used an e-bike and they used regular. I tried an electric bike for a day in Breckenridge CO and loved it–and still got my exercise. This is great. I would love to do a multi-day/night bicycle tour, especially in Europe. So sorry we couldn’t meet up when I was in Brittany the same time. Interesting reading your post because the only other town that I also visited (and stayed in) was Dinan, which goes to show that there is SO much to see in Brittany. Good for you for taking a self-guided trip. I’d surely get lost. Hahaha, no you woudn’t get lost. And if you did, you’d be able to *run* to the next village. Keep up the great runs—and yes, try a bike tour! I would love to explore Brittany at this slow pace. It looks like a marvellous destination. Thx for the inspiration. This sounds perfect. David and I are avid cyclists but we have never done a tour. I have always been put off by the idea of having to cycle too far and hard for it to be enjoyable. I love the idea of having two nights at each stop. I have already checked out the website for Exodus travel and see they have a self-guided tour at Lake Constance in Germany. We are planning a cycling holiday there for next year. I am going to contact them and get some details. Thank you. That’s great to hear, Lyn. We are looking at others, too, maybe in Mallorca or Italy. We’ll look forward to hearing about your cycling in Germany! I love Exodus Travels, but I don’t think I’ll ever take a bike tour. It was fun exploring through your words though…what a fantastic journey you had!! Thanks, Marilyn. I was reminded often as I checked our detailed maps and instructions that this region is excellent for walking tour, too. Enjoy! 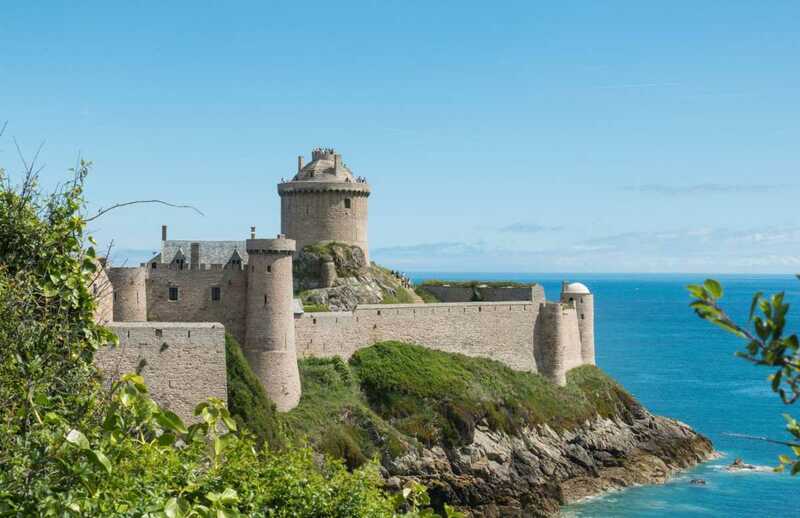 Your Brittany itinerary sounds just wonderful! Tom and I have taken several cycling trips, but none where we’ve been able to stay put for consecutive overnights along the way. I especially like that aspect of the self-guided tour with Exodus. I’m looking forward to hearing more about your cycling trips. We’re ready for more. What a perfect way to travel by bike. Haven’t been on one in decades, but were I to try it, this might be the way I’d go! Photos are spectacular, as always. Looking forward to your next report! Thanks, Jackie. Part two is now posted! I cycled for 2 months across Europe in 1968 & made memories that have lasted a lifetime! There is no better way to meet people & see a country! ooooh, I think I’d like to do that even now! On the down side, I’m older and there’s more traffic. On the plus side, there are many more bike trails, and we have the Euro, cell phones, and…it’s still the best way to see a country. It’s funny how non cyclists react when you tell them you’ve ridden 50km or more in a day, but it’s just as you say. Your body and mind adapt and soon it feels like the new normal.